SINGAPORE, February 11, 2014 (ENS) – A containership and a chemical tanker collided in the Singapore Strait Monday afternoon, spilling some 80 metric tonnes of bunker fuel, the Maritime and Port Authority of Singapore reports. This is the third ship collision in Singaporean waters within the past two weeks that has resulted in an oil spill. Monday’s collision between the departing Liberia-flagged containership Hammonia Thracium and the Panama-flagged chemical tanker Zoey occurred in the busy Singapore Strait, off Sebarok Island, about 10 kilometers (six miles) south of mainland Singapore. Before the incident, MPA’s Port Operations Control Center says it provided traffic information to the two vessels and alerted the Zoey that the vessel Hammonia Thracium was crossing the traffic lane. Hammonia Thracium reports that one of her bunker tanks sustained damage, resulting in spillage of some 80 metric tonnes of bunker fuel. Upon notification, MPA immediately dispatched four patrol craft to deal with the spill. Oil spill response companies have been activated to support the clean-up efforts. The two vessels are currently in stable condition outside of Singapore’s port limits and are assessing their situations. There is no report of injury, and port operations remain unaffected. MPA is investigating the cause of the collision, which is the third within the past two weeks. In total 760 metric tonnes of oil have been spilled as a result of the three collisions. On January 29, following a collision between the departing Hong Kong-flagged chemical tanker Lime Galaxy and the arriving China-flagged containership Fei He, the damaged containership spilled about 280 metric tonnes of fuel oil 2.7 km south of Jurong Island. The next day, January 30, there was a collision between the Panama-flagged container ship NYK Themis and the barge AZ Fuzhou, that caused the NYK Themis to spill about 400mt of fuel oil at Singapore’s East Keppel Fairway. The 105-kilometer long, 16-kilometer wide Singapore Strait connecting the Strait of Malacca and the South China Sea includes Keppel Harbour and many small islands. 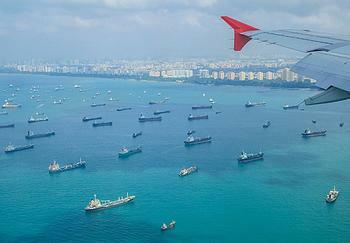 The heavily-trafficked strait provides the deepwater passage to the Port of Singapore. The Maritime and Port Authority has worked with government agencies and the industry to contain and clean up the bunker fuel oil spills. Twenty-four vessels and 120 people were deployed to contain and clean oil from Singaporean waters immediately after the two ship collisions. As of Friday, a total of 40 craft, two skimmers, two harbor busters, more than 1,000 meters of containment boom and more than 400 personnel were deployed by the Maritime and Port Authority and oil spill response companies as part of the containment and clean-up efforts at sea. The Maritime and Port Authority says that after February 3 no oil patches have been detected in Singaporean waters from the two January collisions, although monitoring continues. Sentosa Development Corporation, a government agency, is completing clean-up work on two of Singapore’s Southern Islands, both located around six kilometers south of the city, that were polluted by the oil spills. Sentosa is cleaning Kusu Island, known for its lagoons and pristine beaches, and St. John’s Island, previously known as Pulau Sekijang Bendara. This former quarantine center was transformed in 1975 into a vacation spot with swimming lagoons, beaches, picnic grounds, hiking routes and soccer fields. The island also hosts the Tropical Marine Science Institute and Agri-Food & Veterinary Authority of Singapore’s Marine Aquaculture Centre. Sentosa is co-operating with the National Environment Agency to ensure the surrounding waters are free of oil pollution. The islands remain open, but members of the public are advised to keep away from areas on the beaches affected by the oil spill, where signs have been placed to warn the public away. The National Environment Agency will continue to monitor these beaches and will inform the public when the beaches are re-opened. The agency is also working closely with the National Parks Board and the Singapore Land Authority on the clean-up efforts at Pulau Semakau and will provide more updates when the operations are completed.